WHAT IS YOUR RELIGIOUS AFFILIATION? 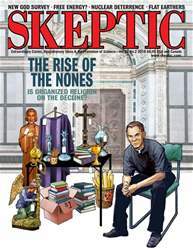 IF YOU DON’T have one that makes you a member of the fastest growing religious cohort in America today, the Nones, or those who check the box for “none” on surveys of religious affiliation. 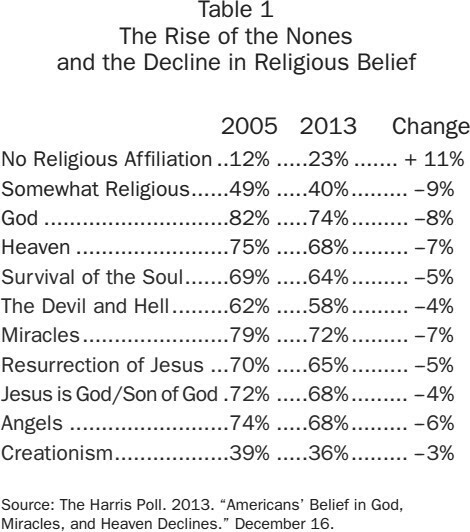 A 2009 study by the American Religious Identification Survey (ARIS), for example, found that between 1990 and 2008 the number of nonreligious persons in the U.S. grew by 19,838,000.2 A 2013 Harris poll on 2,250 adults found that 23 percent of all Americans and 34 percent of Millennials (those born after 1980) have forsaken religion altogether.3 Predictably, rates of belief in God, the soul, and the afterlife, along with other beliefs, are also trending downward for U.S. adults since 2005, presented in Table 1.